(CNN) – She proved to be an important ally for President Obama on the campaign trail in 2008, but don’t bet on Secretary of State Hillary Clinton making a return appearance to the stump this time around. A senior administration official said Monday Clinton would be sitting out the 2012 election, as has been customary for past secretary of states during the campaign season. The position is an apolitical one, the senior administration official explained, and dispatching Clinton on the campaign trail would compromise that. 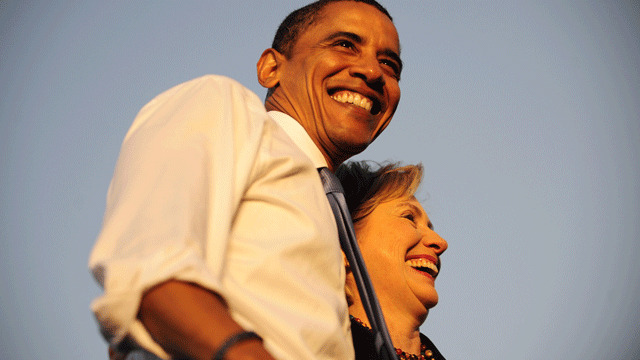 After their bitter primary battle simmered in 2008, Clinton and Obama appeared jointly at several events, fueling speculation the president would choose his former rival as his running mate. The former New York senator remains extremely popular with women voters – a demographic the president won by a healthy 13-point margin in 2008 and one he will need to fare equally well with next November. But the entire Clinton family won’t be absent from 2012 politics entirely. Former President Bill Clinton told MSNBC Monday he and the president have three fundraisers planned in the coming months. They look great together don't they? Just like Julius and Ethyl Rosenberg. People are going to try to say that the Clintons don't approve of the way President Obama has ran the country, but this is obviously not the case. If Bill Clinton is doing fundraisers with the president, they can't disagree that much. Hillary probably just wants to have a break. Lord knows the woman hasn't sat down since she stepped foot in Washington. She is going to do what is customary. Where's the news? I actually wasn't aware of this – probably because it was assumed in the past. Nice tidbit of information for me, personally, at least. You know what, I am so sick and tired of hearing about if Hillary is going to run for President. Give it a rest, she has stated she is not going to. Just let it be will you? Its the same thing when fans out there want to know epsiodes 7-9 of Star Wars and Lucas has stated himself it won't happen and they still insist on asking the question. Even if the Clintons ran again, I won't vote for her. 1 Clinton and 2 Bushes are enough for me. She is doing the right thing by retiring and fading into the sunset. This is just Bill Clinton being his usual self, ego centricual. every time i listen to Hillary I think how smaRT she is. Can't imagin why anyone picked palin as Vp . maybe she will run in 2016. She is smarter than anyone of the repos running now and tougher to. Shes go more balls than all of the repo men running and better sense too. Yet not smart enough to win the Dem nomination in 2008? I think we all know that SHE was smart enough, but the DEMS were dumb enough to vote for Obama. Being smart has nothing to do with winning the White House, lest you forget the disaster that was George W. Bush. In case you're interested in facts, Hillary had the lever pulled more times for her than for any other primary candidate in history, including Barack Obama. If Florida had not gone early in the voting process Hillary would be president now. But, hey, that's politics. Hillary's intelligence has never been questioned, particularly by President Obama. He more than most knows exactly how tough she is and how very smart she is. He was extremely lucky to win the nomination. Had Florida not gone early in the voting process Hillary would be president today. She received more votes as a primary candidate than any candidate in history, including Barack Obama. Secretary of State Hillary Clinton is a class act. She will become the first woman president in 2016! Dump Biden and run her as VP. She serves 4 years...then runs for President in 2016. It's a win-win. They can't lose. I will jump at the chance to vote her in come 2016! She is awesome. We couldn't ask for a more dedicated individual. She has vast political experience in almost all aspects of government and public service. I can't think of any other single individual who has dedicated as much of his/her life to public service. She has managed to handle even the worst of circumstances under the descerning public eye with dignity and grace. She is a born leader. I believe she is the one person who could lead both sides of the isle in effectively leading this country of ours while re-establishing the once honorable and strong reputation we once deserved in the world. I would vote for her in a heart beat. No pressure, Hillary, but please please could you squeeze out just 4 more years? We so deperately need you now more that ever. Well, there's still a chance for that if she wants it. She has definately earned more respect in the past 4 years to change quite a few minds. She is intelligent, well informed of world and local politics, and she would work well with both parties or sides. She has earned the respect of world leaders all around. As Secretary of State she has proven to be tuff when called for. I caucased for her in 2008 and would gladly do it again. Good for her to put country before party. Meanwhile, one of the 5 members of the Republican party that sit on the US Supreme Court retires and we finally get universal health care. But Keep the Government Out of My Medicare!!! So, are you saying you don't need her now?
. I agree 100%. But there's a snag here. And mind you, I mean what I'm about to say to get the wheels cosliructtveny turning and thinking.While you blast (rightfully) the dangerous role of basic economic ignorance and the silly expectations therefrom in the voters' minds in the realm of democratic elections, the hard fact remains that there are many PhD economists, some with popular blogs and web-influence, who are not only partisan Democrats but also ideologically liberal. Krugman is a notable one. Others with popular blogs are DeLong and Thoma. There are others still. Visit Angry Bear and peruse the links on the right column.IOW, despite their sound grasp of basic economics and markets and beyond, the end result is that these professional economists generally support the same candidates and buy into the same rhetoric as many of the very voters you criticize. I think it's all fine and good for you, or Caplan in his book (which I've read), to make this case about economic biases and ignorance and its effects on democracy and voter mentality. I think it's great to recommend a book like Hazlitt's. But this doesn't tackle the larger problem that needs to be addressed:What does this talk about understanding basic econ and markets mean when many PhD economists who have studied well beyond the basic and fundamental tenets of economic thought support the unkeepable promises of candidates and buy into the unrealistic rhetoric that seduces laymen voters?What would a Krugman-like economist say about Bastiat or Hazlitt and the iron clad notions they put forth that they seemingly ignore through their actions? and WHY?In summary, economists who share your view need to start addressing the conflicts with economists who disagree with you before bemoaning the average voter. The average voter is an easy target. Blasting Joe Six Pack for silly views is easy. What to you say to Krugman? or DeLong? or any number economists who agree with them?That's a book I would buy.